I’m sure you already know by now, India is the country that warmed my heart. 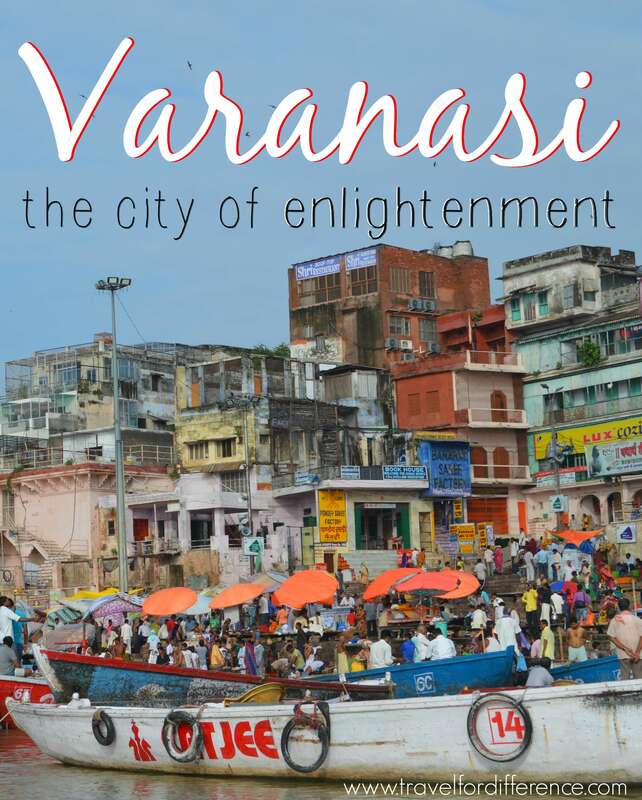 One city in particular, was Varanasi; a city on the banks of the Ganges River in northern India. Somewhere that you must put on your bucket list. This city is completely unapologetic; incredibly colourful, chaotic and culture filled. 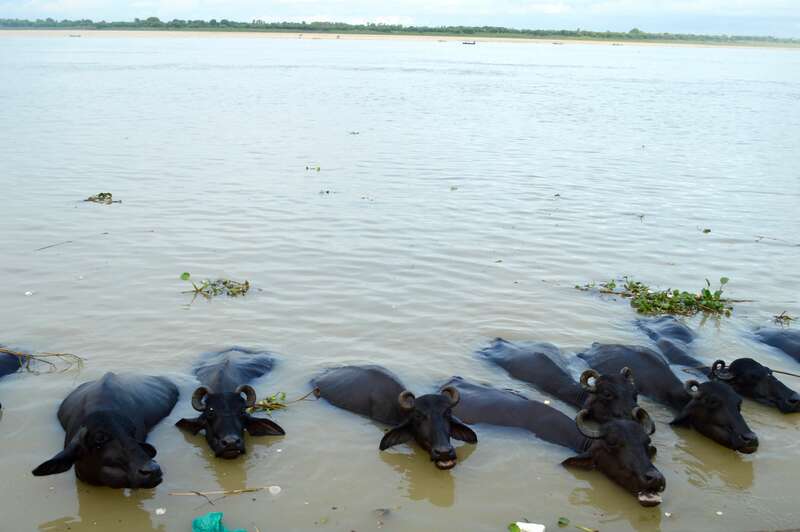 On the banks of the river, you will find burning bodies, cows roaming the ghats, people bathing in the water (water buffalo too) and countless religious ceremonies. I’m going to be completely honest with you, it’s not for the faint-hearted. But if you want to visit somewhere that will feed your soul, this is the city for you. 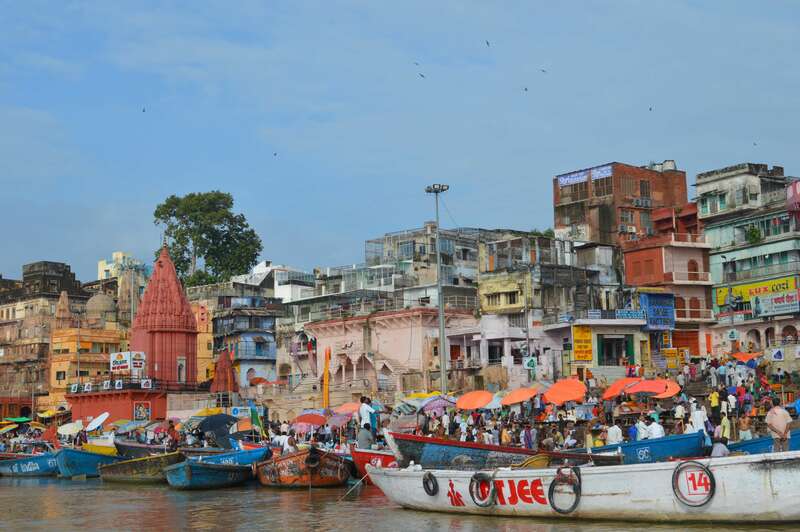 Here are some things you might not know about Varanasi and the incredible Ganges River. 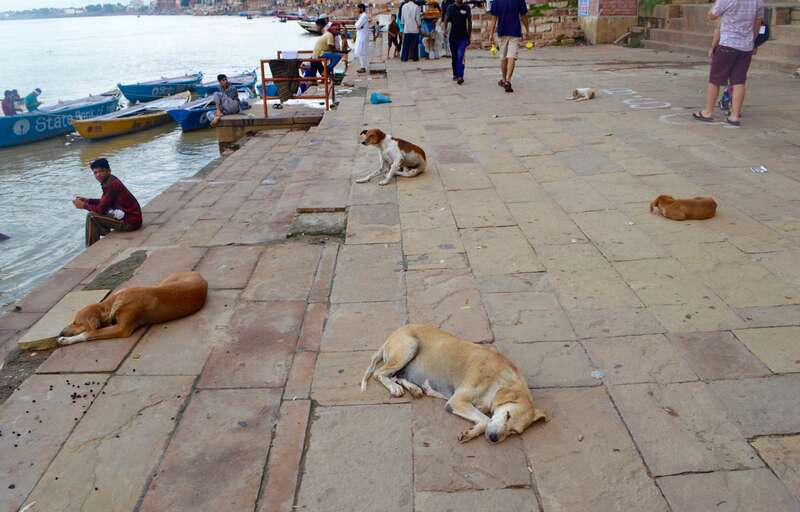 Varanasi is one of the most sacred cities in the world. Although in the locals eyes it is the most sacred. Varanasi is the living symbol of the Hindu renaissance, being home to its culture, knowledge, devotion, art and philosophy. 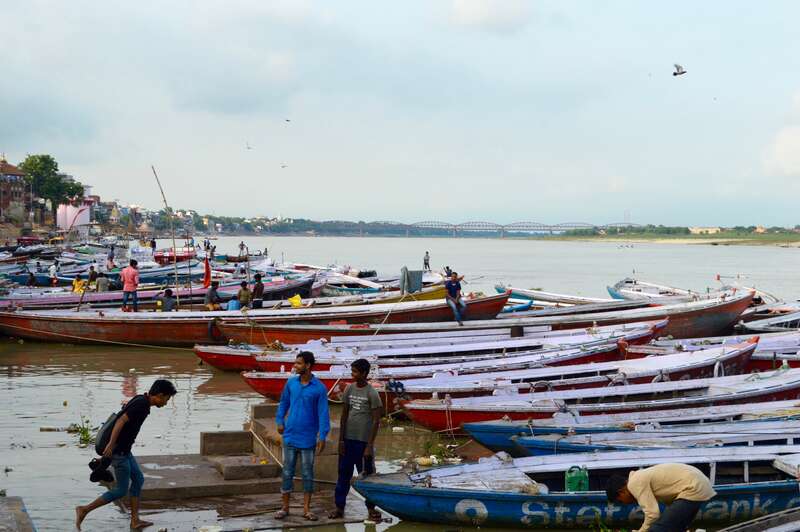 The city is situated on the banks of the River Ganges, lined with around 100 ghats (steps which lead to the water). 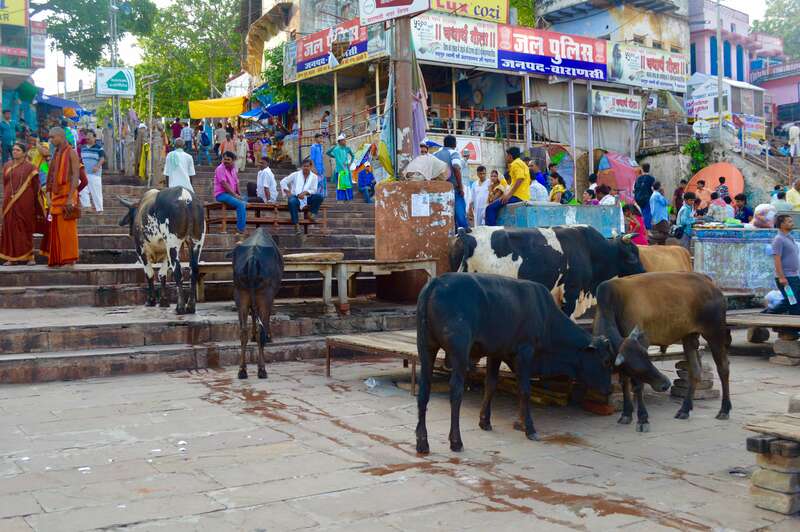 These ghats host many bathing ceremonies, cremations, holy places and more. There are 23,000 temples in Varanasi. 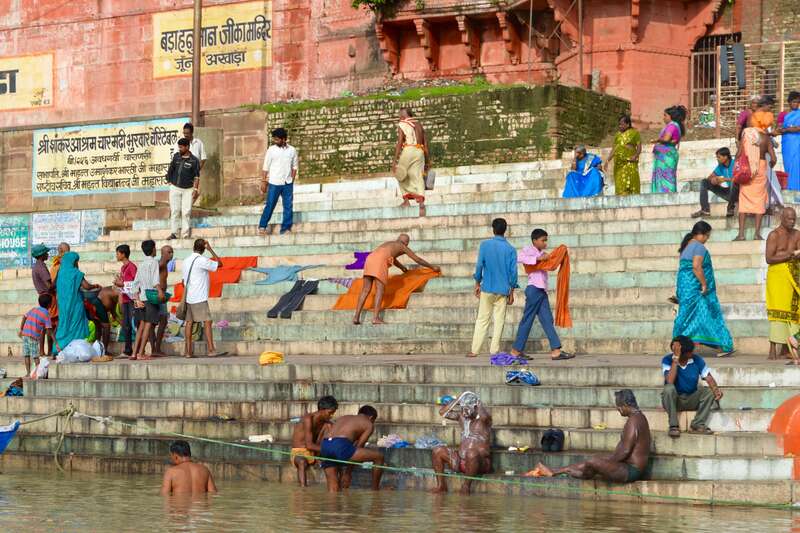 Pilgrims come to the Varanasi ghats lining the River Ganges to wash away a lifetime of sins. Bodies are continuously cremated on the ‘cremation Ghat’, up to 300 a day. In the Hindu culture, it is said to free the soul from the cycle of death and rebirth. The ashes are scattered into the river once the soul has been freed and the body burnt. Although there are 5 types of people that are not cremated. These are children, pregnant women, a holy man, someone with leprosy and someone who died from a snake bite. In these cases, the bodies are simply placed into the river covered in fabric and left for the river to consume. Which I did witness on my trip. 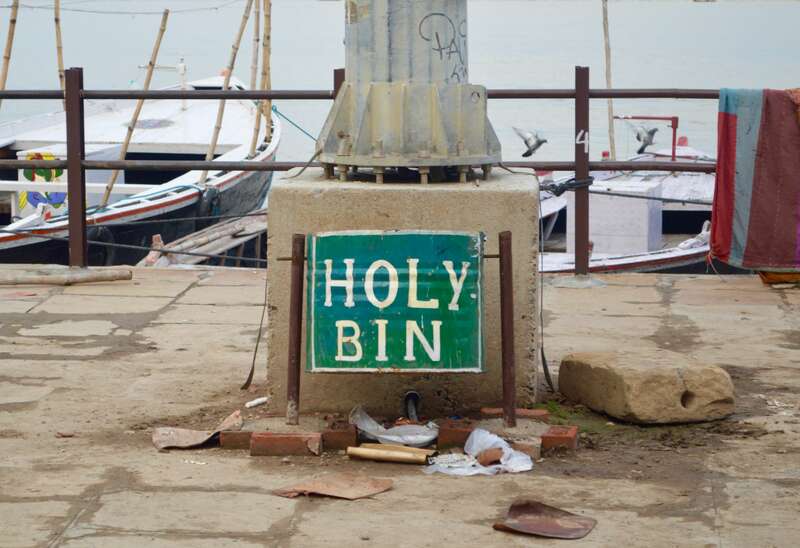 Walking along the crazy Varanasi ghats there are things that will make you smile, cringe, cry and laugh… Just like this ‘holy bin’, ladies toilets and guest house that you probably wouldn’t want to stay in. The sunrise and sunset cruise along the river is truly magical – one of the coolest things to do in India. The sunrise cruise is peaceful, calm and relaxing; with people washing their clothes, bathing in the water and doing their religious practices… On the contrary, the sunset cruise is utterly chaotic, with thousands of people in their boats lining the river bank to view the daily Hindu ceremony. With men hopping over hundreds of boats, selling masala chai and delicious roasted chickpeas… It’s something you can’t miss! The flower ceremony was completely eye-opening for me. I have never seen people so devoted to their religion like I did when I was here. 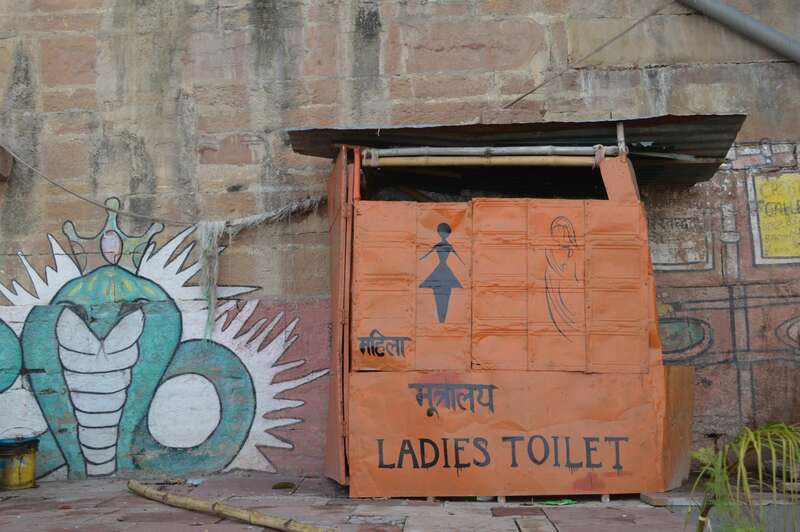 Not only in Varanasi, but in the whole of India. People pray to sacred cows, drink sacred water full of other peoples ashes and are spiritual like no other. I am a non-religious person and have never really had an experience where people worship someone or something like this. During my visit, it was the last 2 days of Ramadan. The city was incredibly busy and full of life, the best time to visit in my opinion. 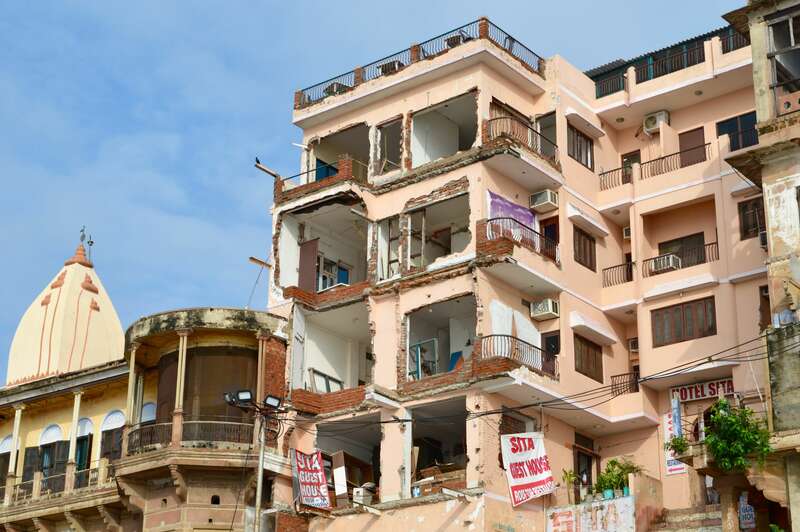 You will no doubt encounter some confronting sights, dirty streets, dead bodies, stray dogs, sacred cows, naked people and more… But that is why this city is so incredible. It’s not a place you would come to in order to have a relaxing time, you’d be kidding yourself if you did. This city is so far from it! But it is a place that will teach you to appreciate the beauty in other cultures and religions, and how to immerse yourself in a life other than your own. You can’t come here and walk around being squeamish, you’ll want to leave after the first minute. You need to take travel however it is thrown your way, and this is a perfect example. We travel not to escape life, but for life to escape us. Throughout the 3 days that I was here, I didn’t witness any other tourists (Let’s be real, I didn’t encounter any throughout the entire trip, apart from in one hotel) so it became very evident that people will stare at you, take photos of you and videos of you on their phones… But contrary to popular belief, they are just admiring your beauty like you are admiring them – and don’t worry, you’ll know the point when it gets too much! You need to be respectful of their religion; photographs of burning bodies are not appreciated, which is why there are none on this blog. Trust me though, I saw some… And so will you on your visit too! This city is something that you won’t see anywhere else in the world. It opened my heart to the impact religion has and the happiness that it gives, but also how people will always come together for a purpose. I have never felt anything like I did when witnessing the ceremonies and the culture of Varanasi, and I don’t think I ever will. That’s okay! It’s not for everybody. I found it magical and completely eye opening. It’s definitely worth considering but it’s certainly not for the light headed or faint hearted, that’s for sure!